SN3788 (A320 OO-TCQ) Lanzarote-Brussels is diverting to Faro. Fuel stop? Estimated Runway Arrival changed to Aug-02-2018 1:24 AM (soon after corrected to 00:15, 90 min delay). Is the fuel so expensive at ACE? Limited supply? SN278 Lome-Accra-BRU (OO-SFM) canceled. Plane might be AOG in Accra as there is no mention that it reached Lome. Guess they saw on arrival that the lights had been switched off. EHEH/EIN closes the shop at 23:00 local. Flight was planned to leave BGY at 19:05 but the actual departure was delayed till 21:29. So the STA of 20:45 was somewhat compromised. Delay may have been technical. EI-EBD flew TLV-BGY and arrived at 17:04 (instead of STA 16:15). Rather unusual for FR to linger on turnarounds so I guess some Mx was planned during these 3 hours at BGY and it tool longer than anticipated. According to FR24, the aircraft landed at EBLG at about 22:45LT. The planned FR4536 EIN-BGY has been cancelled but as the aircraft took off again from LGG only at 04:27, does that mean that the Pax have been bussed from EIN to LGG? Anyhow, empty or not the aircraft landed back at BGY at 05:30. If Pax were on board, the trumpets of glory may have been useful to wake them up and get them off. OK, 7 hours later than planned but these days a good Ryanair is a flight that leaves from an airport near you and brings you where you intended to go and at about the right time (per la prima colazione ... ). If you look at the time and the region when they diverted from their planned route, and you compare that to the route from the previous FR4535, they would have landed in Eindhoven around 22h45 LT too. So before the night curfew there. True they could have landed at EHEH at about the same time as EBLG, i.e. 22:45LT hence before the closing. But they also had to take off as FR4536 and return to BGY. Impossible before the curfew. And they needed the machine for the next morning service out of BGY. 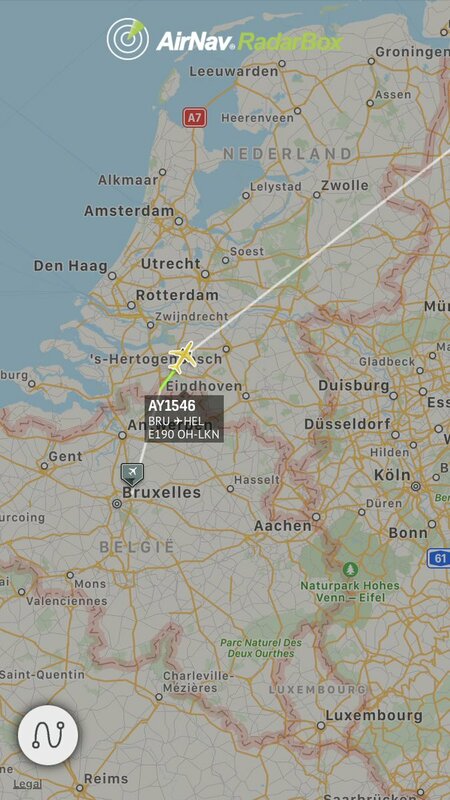 Trident, normally on its way to Las Palmas, seems to be returning home after circling above Olen/Herentals. Finnair AY1546 (Embraer 190 OH-LKN oneworld livery) from Brussels to Helsinki declared an emergency (squawk 7700) shortly after taking off from Brussels, but eventually continued flying to destination with on-time arrival. Is there something going on at EBBR, on Apron 2 North, stand 233 or 237, near the B Pier? At around 1530LT, FR24 shows Fire019-027-308 and -026. Later arrived Fire001 and 507. Signals come and go intermittently but most are still there at 1645LT. The flight deck clearly overreacted!